Google’s Roman Nurik has announced that the company’s Google I/O 2012 conference app is now live, offering session listings, scheduling and more. 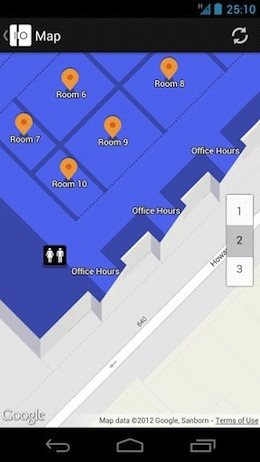 There is a live streaming component that will go active during the conference, as well as the normal lab and session scheduling and maps to help you get around. The 2012 edition of the app once again supports Android 2.2+ devices of all shapes and sizes. With the app you can browse through sessions and code labs, manage your schedule (from the app or from your Android 3.0+ device’s home screen! ), orient yourself with a map, and more. 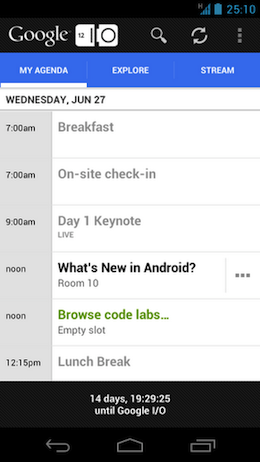 We’ve also added the ability to watch I/O Live streams on your Android 3.0+ devices (available during the conference). Nurik mentions that Google will be open-sourcing the app just after the conference as well. Google I/O runs June 27-June 29th in San Francisco and The Next Web will be there to cover it. The conference sold out in 20 minutes but will stream the keynote and all other ‘key sessions’ live.